The majority of people we meet on our journey are kind, curious and welcoming. An orchard owner in the St. Croix River urged us to take as many free apples as we could carry. A gas station attendant took her smoke break early to inquire about our bicycles and our route. A retired man in Cordova, IL insisted we pitch our tent in his yard but not before a shared a cold beer with him and listened to some of his vintage rock records. Nevertheless, we always have to be on our guard. We are strangers where we ride and are physically vulnerable on our bicycles. So when I saw a silver convertible pass us and then do a U-turn in my rear-view mirror, my radar went off. The convertible drove up from behind then pulled onto the shoulder ahead of us. At this point, Kristen and I had stopped and exchanged questioning glances. A middle aged couple bounded out of the car and came striding up to us excitedly. Before we could make out their faces, the woman cried, “we took your photo in Nevis, MN!” Instantly, we recognized Randy and Sandy, whom we had met as we fussed with our camera trying to take a self-timed photo in front of the World’s Largest Tiger Musky. That was more then 500 miles and three weeks ago. Our collective excitement turned to disbelief as we considered the odds of us crossing paths with each other. When we first met, Randy and Sandy had driven up from Rochester, MN to look for a piece of property on one of the many beautiful lakes that surround Nevis. 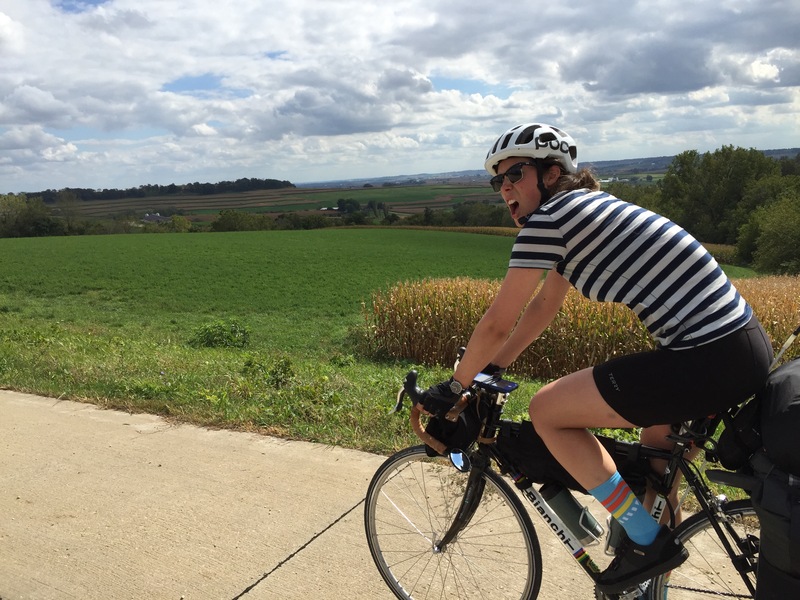 Today, they were driving the Great River Road after a visit to in-laws, the same day Kristen and I were riding south from Guttenberg to Dubuque. Our reunion happened to coincide with the hilliest day on our trip. 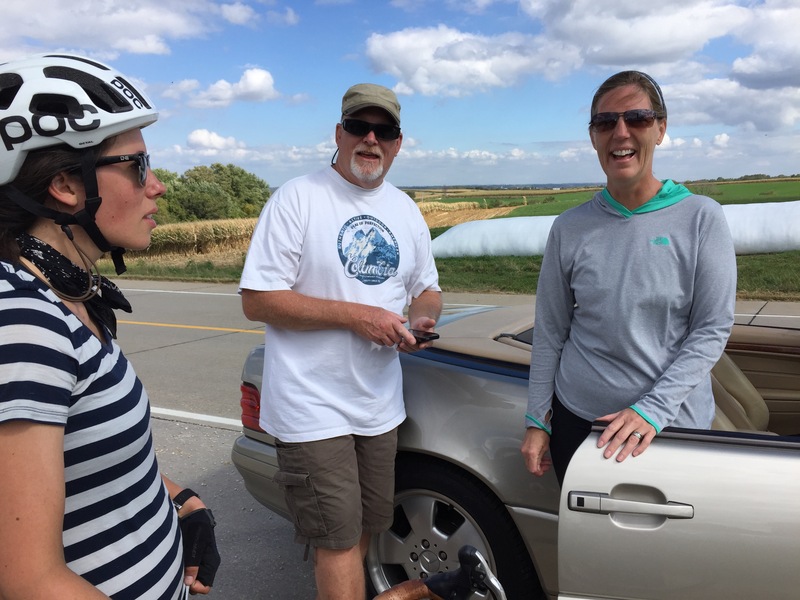 Randy and Sandy caught up with us on the interminable climb up to Balltown, IA, which felt like it must be situated at the highest point in the Midwest. Randy informed us that they had just come from an iconic restaurant at the summit and that we should stop in for the experience. We ruefully admitted that we had a meager picnic lunch planned but that we would enjoy the view nonetheless. Without hesitation he took out his wallet and pressed a $20 bill into my hand and said lunch at the summit was on them. Overcome with gratitude, we breathlessly thanked them both and said warm farewells. We pedaled on in disbelief, hardly taking notice of the remaining climb. 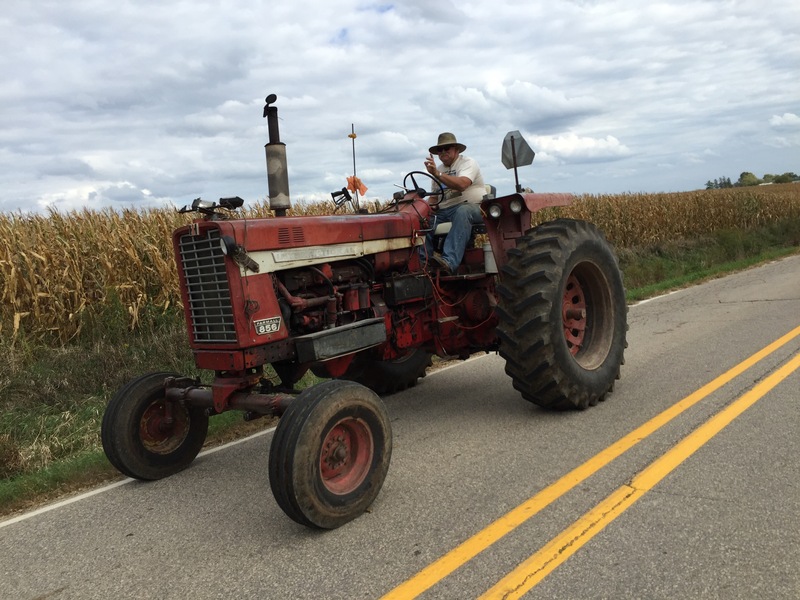 As we rolled into Balltown we were treated to another surprise. The day had been crisp and beautiful and hundreds of motorcycles had passed us on their Sunday ride. 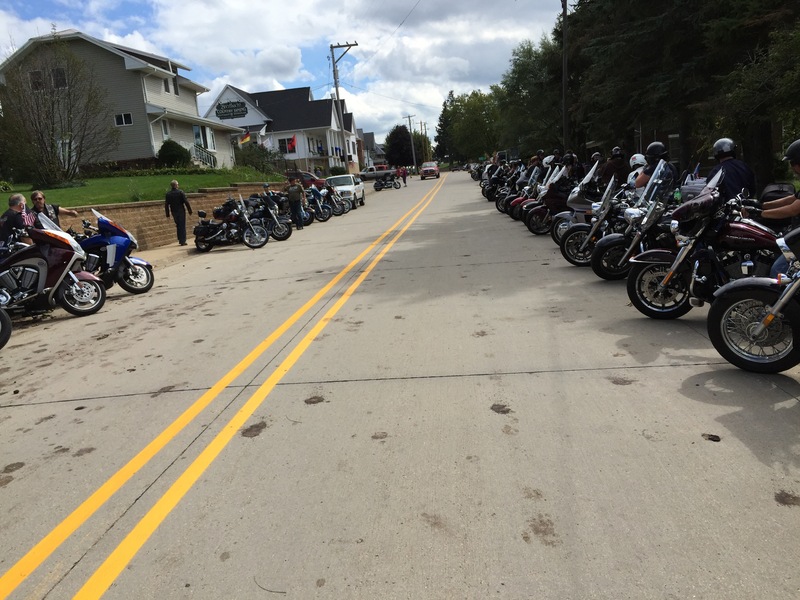 As we came upon the scenic overlook on the outskirts of town, we noticed a long line of parked bikes. Rounding the bend into downtown, we saw the line of motorcycles extended unbroken down both sides of the street as far as we could see. A rider looked up from tinkering on his bike and exclaimed, “we passed you guys 20 miles ago!” The rest of his gang cheered, which attracted the attention of other riders. As we struggled the final blocks to the restaurant, the cheer of encouragement echoed up and down the street, putting big grins on our faces. 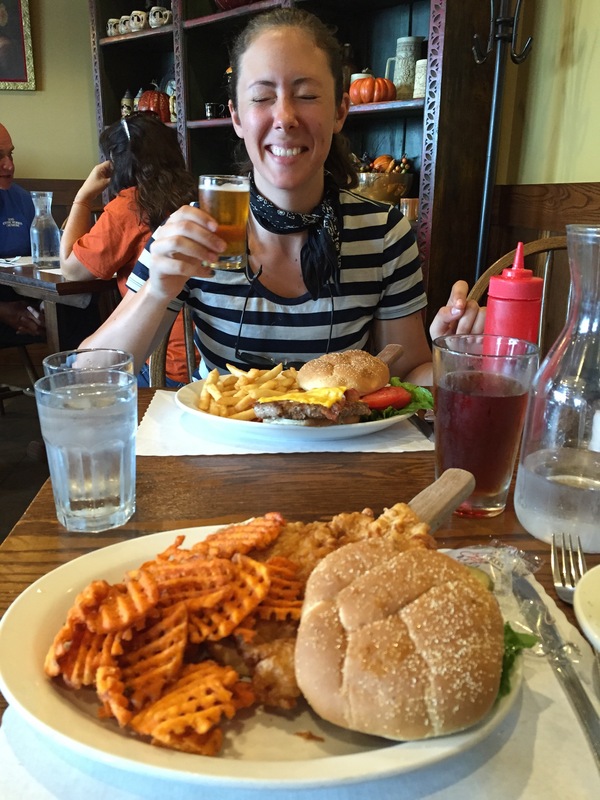 It seemed that the restaurant was the rallying point for every motorcyclist within a hundred miles. As we stepped foot inside the sprawling tavern, we saw a sea of jeans, bandanas and leather vests adorned with bike club insignias. After eagerly taking our seats, our ravenous eyes could hardly settle on which of the delicacies we wanted for our special lunch. After climbing nearly 3,000 feet, we were prepare to eat anything in sight. We decided to celebrate with some local beers and toasted Randy and Sandy. 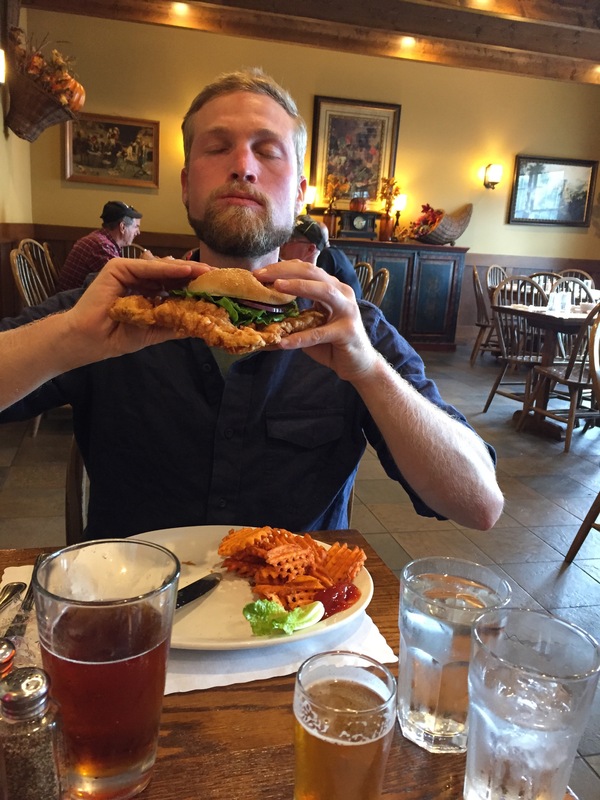 I ordered the house specialty – a breaded and fried pork cutlet the size of a dinner plate. Kristen got a stacked double bacon cheeseburger. We ate with relish in silence. As we were settling up, the proprietor came over and thanked us for our business. We admitted that we would not have stopped at his establishment but for the chance meeting with our friends from Nevis and their generosity. Upon learning that we were on a bike trip, he shared that he, too, was an avid cyclist. Some urgent business took the owner away and we returned to our bikes and prepared to continue riding. Just as we were about to roll out of the parking lot, the owner reappeared and hurried over to us. He wished us a safe onward journey and pressed something into Kristen’s hand. “Next lunch is on me.” Kristen opened her hand. In it was a $20 bill. What a great time you must be having and experiencing. Thank you for sharing your adventures, it has been fun reading them. Safe journeys.